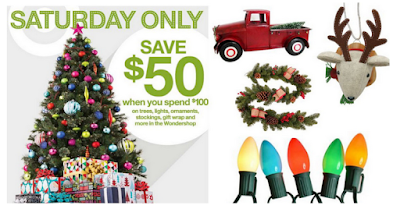 Through 11/26 ONLY, Target is offering up a whopping $50 off when you spend $100 or more in their Wondershop department (as part of their 10 Days of Deals promo), valid both in-store AND online. Use this hefty discount to save BIG on Christmas decor, gift wrap, stockings and much more. This promo IS LIVE ONLINE! There may be a promo code needed, so make sure you look for that once this goes live.